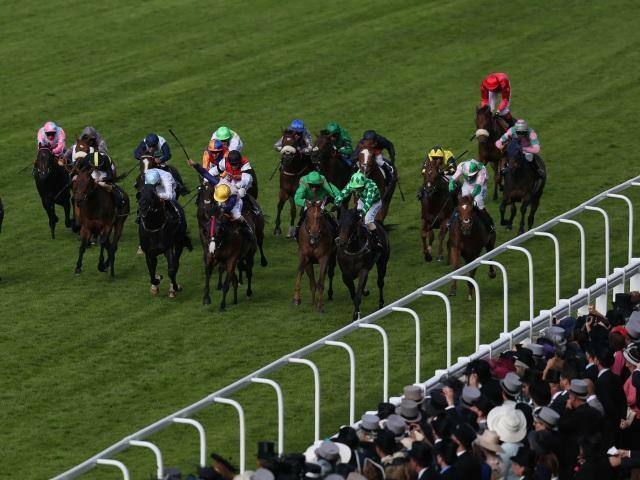 In the third part of our new series Timeform's Simon Rowlands shows how Timeform Ratings can be used for more than just assessing a horses performance, and gives some examples based around Ascot ahead of the start of tomorrow's Royal meeting. "Good though Jamie Spencer is at Ascot, he is no Saeed bin Suroor"
Earlier pieces in the Timeform Knowledge series dealt with how ratings may be used to assess the performance of horses. But ratings need not be restricted to horses alone. The horses are the ones who do the running, of course - and ratings measure performance in that context - but numerous factors are linked with each horse's performance, including the draw, jockeyship, trainer ability, race strength, and so on, each of which can be measured by the same means. The fact that the draw is made randomly means it is one of the easier subjects to tackle in some respects, though, as anyone who has worked in this area will testify, there can be some remarkably fiddly aspects associated with it. That randomness means ratings should tell us something about the effect of the draw, providing we get a large enough, and appropriate enough, sample. In order to mitigate the potential effect of sample bias, handicaps (in which the differences in abilities between horses have theoretically been equalised) provide a better test bed than races which have a wider spread of talent. It must also be remembered that the method for numbering stalls was changed in Britain on 30 March 2011 (Ireland followed suit on 10 April that year), so that stalls became numbered from inside to outside and not always from left to right, as had been the case previously. Both before and after that date, stalls have tended to be shuffled across in the event of non-runners rather than having stalls left empty (though this is not applied consistently). Both factors require recoding of the data. The former is, for instance, relevant to racing at Ascot, where what once was a low draw is now a high draw, and vice versa. We can look at the result of races at that course since that date (thus avoiding the need for recoding) and measure the effect of the draw in terms of how groups of stalls performed compared to expectation and in terms of ratings. 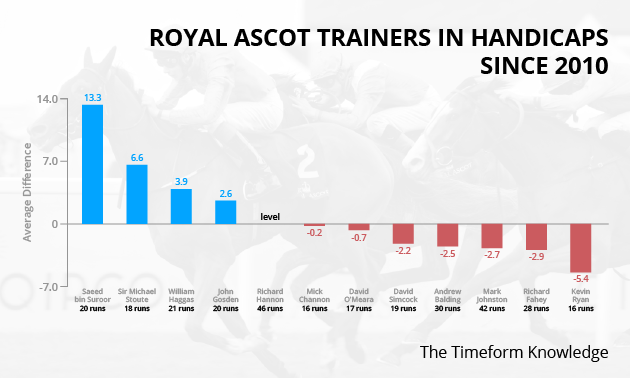 The following results for shorter-distance races at Ascot use the Timeform performance rating compared to the handicap mark off which the horses ran (preferred to Timeform master ratings only in that an "expected" value always exists). There is no evidence of a big draw bias at shorter distances on the straight course at Ascot - else those advantage/disadvantage values would be larger and more consistent - but there is of a smaller one. The lowest-third of the field has a negative expectation at all three distances, while the highest-third is clearly positive in two of the three instances. Across all three distances (which, remember, share the same track so should not be entirely independent of each other), the values are: Low, minus 0.6 lb; Middle, minus 0.3 lb; High, plus 0.9 lb. The fact that highly-drawn horses have an advantage of in the region of 1.5 lb over lowly-drawn horses, taken overall, may or may not cause you to bet one way rather than another. 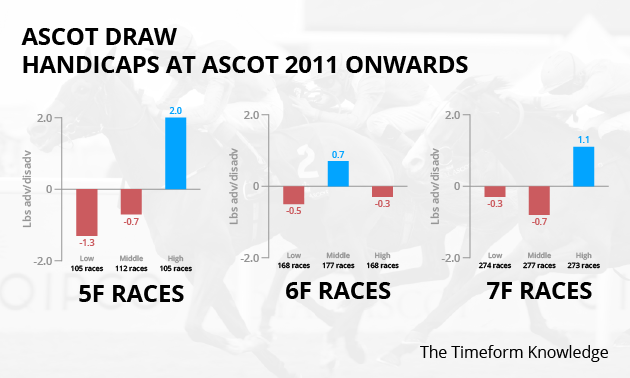 The difference is just over half a length at seven furlongs, though races can be won and lost by even smaller margins. But you would do as well to consider the evidence, and by measuring that evidence with ratings it is possible to incorporate the findings into a wider ratings-based analysis. 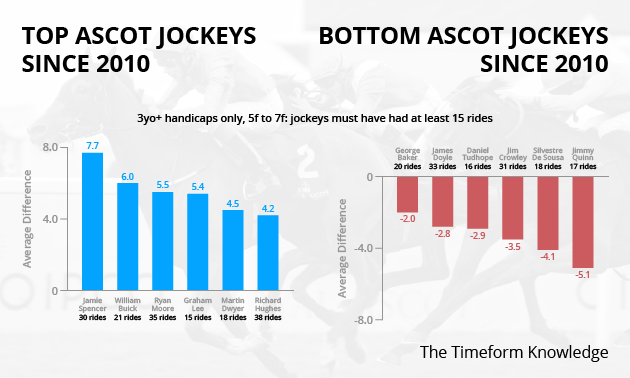 A similar process applied to jockeys in handicaps at shorter distances at Ascot reveals some much bigger effects, though these may be in part down to the smaller sample sizes. Only jockeys which had at least 15 rides in qualifying races at the course since 2010 were considered, and their average performance was compared to the average performance for all jockeys at the course in that time. Jockeys who have a good number of rides tend, unsurprisingly, to perform better than the jockey population as a whole. Jamie Spencer has outperformed par by an average of a whopping 7.7 lb across 30 rides. Large fields at Ascot tend to produce strong paces, which, combined with the fairly stiff finish, can set things up for patiently-ridden horses. Spencer - a course specialist by the look of it - is a master at pulling off such rides. It is no surprise to see such gifted practitioners as Ryan Moore and Richard Hughes up there, either. Those who have underperformed have done so by lesser amounts than those at the opposite end of the table have overperformed. Thirty rides may seem a decent number, but if those 30 rides came in races averaging, say, 20 runners, then a jockey could easily perform very well and yet fail to ride a winner. Ratings are a much more nuanced way of judging performance than simple wins/losses. And we can look at trainers, too. How about trainers in handicaps, not at all Ascot meetings and at distances short of a mile, but specifically at Royal Ascot and at all distances? Only a dozen trainers passed the "15 runners or more" cut-off point in the last four years, but some of their values vary greatly. Good though Jamie Spencer is at Ascot, he is no Saeed bin Suroor, whose horses have surpassed expectations by a long way in handicaps at the Royal Meeting in the last four years. Sir Michael Stoute, William Haggas and John Gosden also have records worth boasting about. Those draw figures quoted earlier look minuscule in comparison. Again, such effects can get lost in simple win/lose metrics. Making decisions from small amounts of data comes with the territory in horseracing analysis, but it is therefore even more crucial to use sophisticated measurements rather than crude ones. Ratings - expressed in terms of weight, but not obsessed with weight as some seem to imagine - can be seen as the most important language of measurement in horse racing analysis. It is important to know whether a horse, a jockey, or a trainer, has performed well or badly and not just whether it, or they, won or lost. And it is important to understand this in a detailed and nuanced way. The benefits of doing so are there for all to see.